This is the first half of my personal list of my FAV k-dramas that is neither listed in any particular order nor by any means comprehensive or fair. I will put the part 2 up as soon as I can, this blog is taking far more time than I expected to finish. So let's get right on with it! Click on the names to watchable sites if there are any. SIDE NOTE: There are many great "older" dramas that really belongs to the "last generation“ of k-dramas, for ease of actually finding good quality versions to watch+ being subbed, I have left these ones out of this list. ANOTHER SIDE NOTE: Viki.com just made many dramas unavailable to "standard pass" holders so you have to pay more to upgrade to access older dramas. Shame on you! You are making people who have followed your site for a long time feel like they are nothing unless they have money to spare! I put this one up first because it's the first one that would come to my mind when I think about Korean dramas. The success it managed to achieve is "in my opinion" still not surpassed by anything else ever since (I know the crazy success of Descendants of the Sun but I don't consider DOS as that great of a drama storywise). This K-drama was HUGE globally when it aired, causing YSL no. 52 lipsticks to run out of stock for months everywhere because Jun Ji Hyun wore it in the drama. It made Kim Soo Hyun a household name in China and for a year or two he is EVERYWHERE in ads (from bakery to skincare). The story is simple enough, 400 year old stuck on earth alien man meets super actress woman who conveniently moves in next door and is also his student at the university. But that is just the set-up of the story, things go crazy from here. So why is this drama so captivating? Well, I would first give all this success to the brilliant story telling of this drama that has a great mix of comedy, drama, mystery/thriller that never lags. Every episode ends on a powerful note that automatically sends the viewers to watch the next. Then there was the acting that is just done perfectly to a T. Jun Ji Hyun is the queen of acting in Korea, and Kim Soo Hyun is a natural. Their chemistry is so good no matter how unrealistic the story is, you BELIEVE it to be real. And did I mention it is ridiculously funny? Hahahahahaha, I laughed to tears so many times watching this drama, and the OST is insanely amazing! So if you for some reason NEVER WATCHED A KOREAN DRAMA, go watch this one first! Some people might be surprised by this one because it is relatively lesser known and slightly far back in time. I don't even remember how I came across this one but I was so hooked and touched by this drama it kind of earned a special place in my heart. This drama can be classified as one of those hate-to-love classic dramas that has the two leads absolutely despise each other in the beginning and gradually through their joined experiences fall deeply for each another. The fictional premise is that South Korea is a constitutional monarchy while North is well... as what North is in reality. Lee Seung Gi plays the younger brother to the current King of SK who was set to marry a NK solider played by Ha Ji Won, daughter of a NK high official for political alliance. The story is very well-paced, exciting but not without super fun or tender moments, and both leads are phenomenal in their portrayal of their characters. In many ways I would say this is one of the best acted k-dramas of all times. The only thing I'm not sure about is their portrayal of NK because frankly speaking, SK people have very little idea about how things actually are in NK, especially when it comes to the "mentality" part. But apart from this the drama is filled with emotional highs and delicious acting + plot twists. Both leading characters complete a great character arc which is not always seen in a drama. And the second couple's arc (between the princess and her body guard soldier) is also heart-breakingly beautiful to watch. If you don't fall in love with them at the end of the drama you can make me to eat shoes which I would politely refuse unless they are made of chocolate. It is with great reasons that this drama has a 9.8 rating on Viki.com. Every aspect is so well executed that I really can't complain about anything regarding this drama. This drama deals with corruptions in politics, the integrity of journalism and social justice, all of which are very popular topics in the K-drama world. Ji Chang Wook plays a gun-for-hire type of guy who is so good at physical combat he could probably take down Li Min Ho's character in City Hunter. Park Min Young plays inspired journalist who is fierce and courageous at pursuing truth even though she is tiny and has no special powers. Both leads have very troubled past/childhood that would later play a very important part in the plot line. This drama has plenty of actions, suspensions, emotional upheaval and funny moments. Plus both leads are so pretty to look at and their styling in this drama is really lovely to watch, you just get pure drama satisfaction watching Healer. It will be 20 hours well spent in your life and beware of the very memorable theme music that will be stuck in your head long after you've finished watching it. Highly recommended! Admittedly I'm still watching this drama as I wrote this blog. 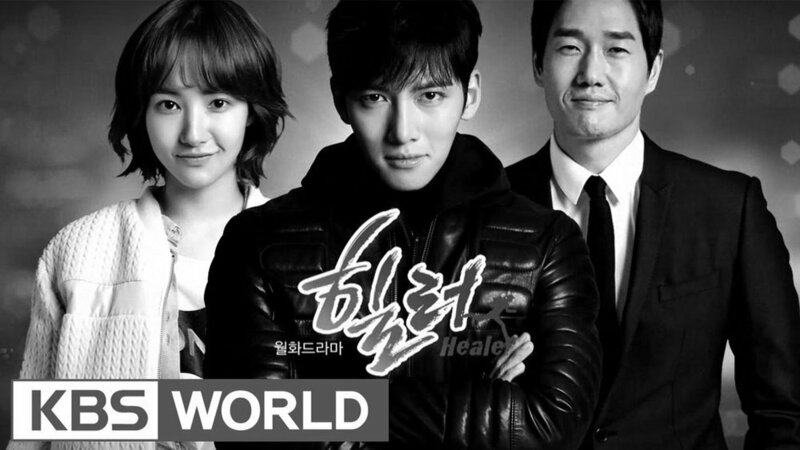 I know it's a bit late catching up, but back when it aired I was still in the Healer mood I couldn't watch anything else. This is another highly rated k-drama by almost everyone and every site I have come across, so I put my good faith in the wisdom of the public and went into watching it. The male lead role played by Ji Sung has D.I.D due to traumas in his life. He has seven personalities who can take over his body and time, and as an heir to a giant enterprise, just imagine the amount of trouble this can give him (a nod to Split here, James McAvoy wasn't the first one who had to play 7 people in a show). The female lead played by Hwang Jung Eum is a psychiatric doctor who through a series of events became entangled with him...and his problem. While neither leads are the biggest k-drama acting names out there, this drama's story is the main reason for its huge success. Watching those vastly different characters with one person's face and body is fun enough and good enough as a reason to pick up this drama. The actors do a brilliant job making their characters convincing and interesting. The premise of the story has so much potential to go horribly wrong, yet to our good fortune it didn't go down that route. If you're interested in a multiple personality story, this is your go-to k-drama. This drama shows you what happens when real life chemistry translates to screen, because the lead actor and actress were for a time, a real couple off screen. And...well, you can practically taste the electric exchanges that are constantly sparking off between them. Our leading female character played by Yoo In Na is a small actress who is trying to make her name in the business. She landed a role as Queen In Hyun in a historical drama, and who is better to help her acting the right part than a man who is from that period? The leading male character played by Ji Hyun Woo is a Chongson scholar who escaped an assassination attempt through a magical talisman and landed in contemporary Seoul. Obviously they meet and they fall for each other, while dealing with all the drama with voluntary or involuntary time travel. This drama was aired in 2012, so quite a bit time ago, and production techniques and qualities have improved since then, but the acting and story telling of this drama is so strong it still remains one of the best romantic dramas from the k-drama land. Watch this one you will laugh and cry with the characters and you will taste what true love really is like.